NACOGDOCHES, Texas - Stephen F. Austin State University music faculty members J.D. 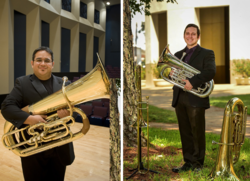 Salas and Daniel Chapa will present a tuba and euphonium recital with collaborative pianist Hyun Ji Oh in the opening event of the 14th annual SFA Octubafest celebration. The concert is at 7:30 p.m. Wednesday, Oct. 17, in Cole Concert Hall and is part of the SFA Friends of Music Concert Series. Octubafest is an international concert and recital series started by the Harvey Phillips Foundation to showcase the tuba and euphonium as solo instruments, according to Salas. "Throughout the month of October, universities around the world will host celebrations, including guest artist recitals, chamber music concerts and other tuba-euphonium related events," he said. Salas will perform J.E. Barat's "Introduction and Dance" and Frank Gulino's "Onwards and Upwards," which is a piece commissioned in 2017 by a consortium in which Salas was involved. He will also perform "Squareman's Jazz" by Ben McMillan. "This is a piece for unaccompanied tuba that I will be interpreting a little differently by using several effects pedals to further highlight the various styles in the piece," Salas said. Chapa, performing on euphonium, will showcase one of his favorite arrangements of Felix Mendelssohn's "Songs Without Words (Op. 53 No. 4)." "I first encountered this piece in one of my music theory classes during my time as a graduate student at the University of North Texas," he said. "After analyzing and listening to the beautiful melodic line, I also noticed the melody stayed in the upper voice for the entirety of the song. This type of scoring made Mendelssohn's song and several others very easy to arrange and a lot of fun to play!" On trombone, Chapa will perform "Song for Ina" by Philip Sparke. The piece was originally composed for euphonium solo with brass band. There have been several adaptations of the piece including this particular arrangement of solo trombone with a tuba-euphonium quintet. Chapa will also perform McMillan's "Tomes of Hardened Steel," which was composed for tuba and CD. The composer writes, "Initially I wasn't intending to create an orchestral sound, but the more I played around with the gems of ideas, the more I found it leaning towards an epic fantasy film score in three movements - 'Across the Plains,' 'Fountain of Dusklight' and 'Juggernaut.' Though the title suggests a vague story, I prefer to leave the specifics up to the listener." Concert tickets are $8 for adults, $6 for seniors and $3 for students and youth. For tickets or more information, call the SFA Fine Arts Box Office at (936) 468-6407 or visit www.finearts.sfasu.edu.